Billions of dollars are spent every year on antivirus software alone by enterprise because they know that computer virus can cause a lot of down time and making the company lose money. A computer virus can be programmed to do anything such as stealing sensitive information, locking up or slowing down the computer, data loss through corruption or deletion, and etc. With so many brands around and they all claim to be have the best detection and lightest in system resource, it is certainly not easy determining which is really the best. 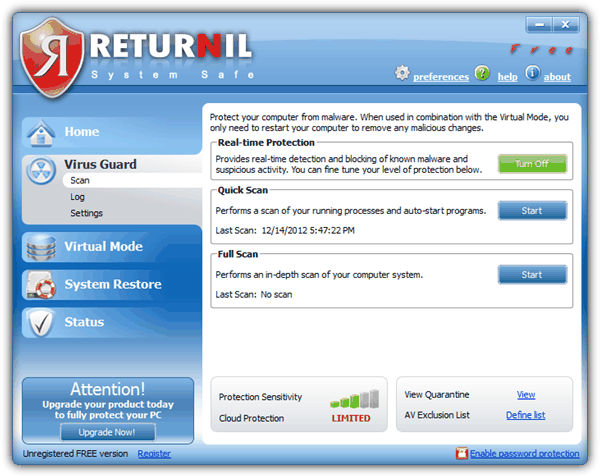 As for home users, most antivirus companies also offers a cheaper version that works on Windows operating system and requires an annual subscription. However, there is also a wealth of anti-virus software offered for free with the catch of disabling some of the extra defense system such as firewall, behavior blocking and also only allowing you to use it for personal home use only. After extensive research, we have come up with an up-to-date comprehensive list of free anti-virus programs for your convenience. Recently avast! Free Antivirus has gained a lot of popularity and has even taken the first spot in CNET’s Download.com overtaking AVG and Avira. After installing avast! Free Antivirus on our test computer, it didn’t even feel like running a crippled slim down version of an antivirus program because it has all the features from the paid version except SafeZone, Firewall and Anti-spam. The comparison chart displayed on their website says that the sandbox feature is unavailable on the free version but in fact it’s actually still there. Other than blocking virus and spyware, what we really liked about avast! 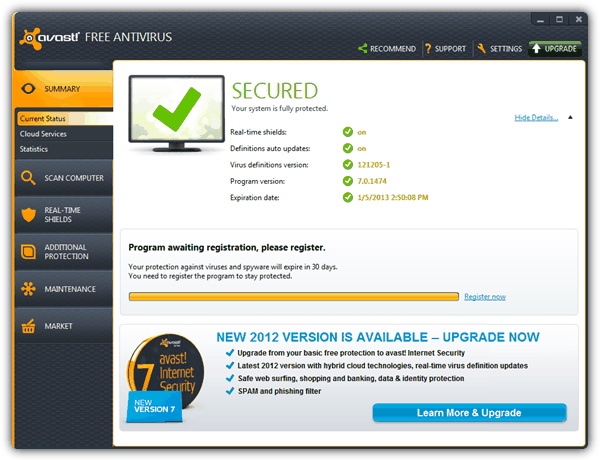 Free Antivirus is it takes up very little memory usage and comes with extra features such as auto sandbox, boot-time scan, remote assistance, non-annoying browser protection plugins, 8 different real-time shields and cloud reputation service. 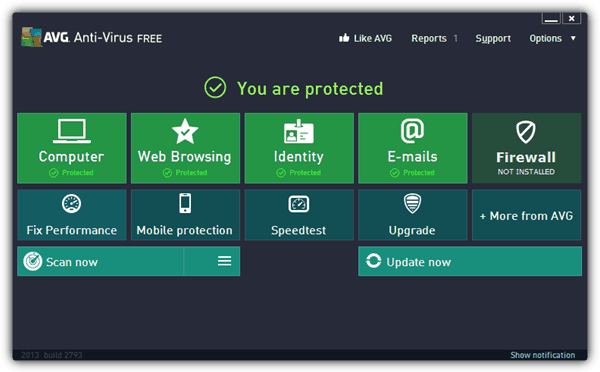 The free version of AVG AntiVirus used to be the most popular and well known free antivirus software and they are currently at the second spot after avast! Free Antivirus. AVG has an updated graphical user interface to match the Windows 8 modern UI. It helps protect your computer from viruses, malicious emails, web-based attacks, and identity theft. The anti-spam, firewall and performance fix functions are excluded from the free version. Surprisingly phone support is available to free users but only for certain countries such as US and UK. We were quite annoyed by the whole installation process because it takes 3 steps to get it completely installed and updated. Firstly we need to download a small 4MB web installer to download the full installation file. After installation, there’s another 60MB of definition file to download. They do have the full distributable setup file buried somewhere deep in their website. Pay attention during install as the AVG Security Toolbar will install by default. We were eager to test Ad-Aware Free Antivirus+ because it used to be a very good anti-spyware program that in recent years has turned into a full fledged antivirus program and taking the third spot. The free version of Ad-Aware uses the Vipre engine but weirdly Ad-Aware Total Security uses G Data’s engine. The user interface looks a bit dated and not very user friendly at first as we had to look a bit harder to find the button to manually check for definition updates. Most of the advanced protection features that is taking most of the space on the GUI are unavailable in the free version. The installation process wasn’t that bad as the 6MB installer automatically downloads and installs the latest version of program and definition on your computer. There is a gaming mode where you can turn off all notification to prevent you from being kicked out while you are playing a full screen game. Avira is well known for its superior detection where it tags everything that moves silently in the Windows operating system. After installing Avira, you should see that most of the features are grayed out and only the button to enable/disable the real time protection against virus, trojan, spyware and malware is accessible. Avira Free Antivirus used to rank number 1 but has dropped to 4 probably due to them embedding a toolbar and changing the web browser’s default search provider to ASK.com. Although the SearchFree toolbar by ASK.com can be opted out of during installation, it is with a cost of disabling the web protection feature. Moreover the daily notifier popups of recommending you to upgrade is a bit annoying as well. ZoneAlarm (now owned by Check Point), well known for their firewall applications has added an award winning antivirus engine by Kaspersky. If you didn’t know, Kaspersky has always been a shareware that is at the top spots for independent detection rate tests even if they do not take the first place. Thanks to ZoneAlarm, they made it possible for anyone to use the excellent Kaspersky engine from their ZoneAlarm Free Antivirus + Firewall product. 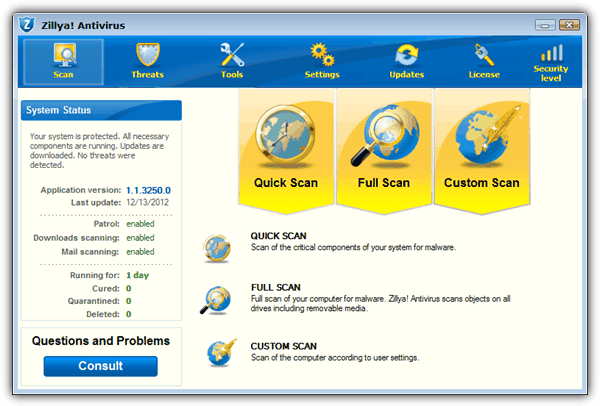 Most free antivirus software offers very minimal functionality other than the real time virus detection and protection but ZoneAlarm wins in this area by offering a really good antivirus engine, identity protection and a firewall if you need protection against hackers getting in to your computer. Both the user interface and settings are straight forward and not confusing. The game mode can be enabled from the Tools menu and you can even password protect the application to prevent against unauthorized access to the program. As you may have guessed correctly, Microsoft Security Essentials is developed by Microsoft themselves and is free for all Windows licensed users. It comes with real time malware protection and automated scheduled scanning. The default scheduled scanning options are configured not to disturb the user because it will only start when your PC is not in use and when it does, it takes up a maximum of 50% CPU usage. You can configure the exclusions of files, locations, file types and processes. 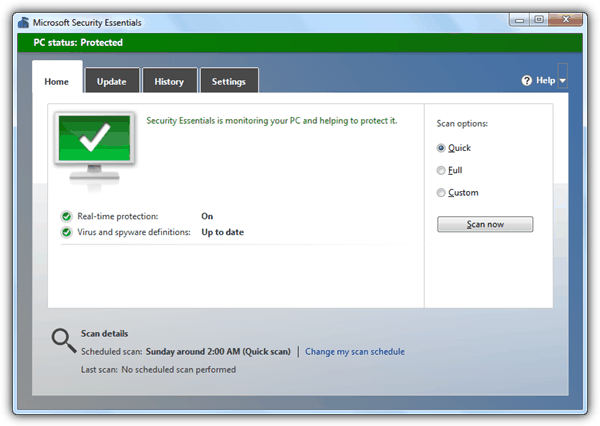 Compatibility and stability are probably the reasons why we will recommend Microsoft Security Essentials to people. However we wouldn’t count on the detection rate as they only achieved a 64% detection rate on the zero-day threats at the recent AV-Test. Windows 8 has Security Essentials integrated into the o/s but under the name of Windows Defender. Although it offers basic security, Defender shouldn’t be relied upon to offer the same level of protection as other more advanced free security packages. Cloud based antivirus differs from the traditional types by putting most of the analysis load on the antivirus infrastructure rather than on the local computer. 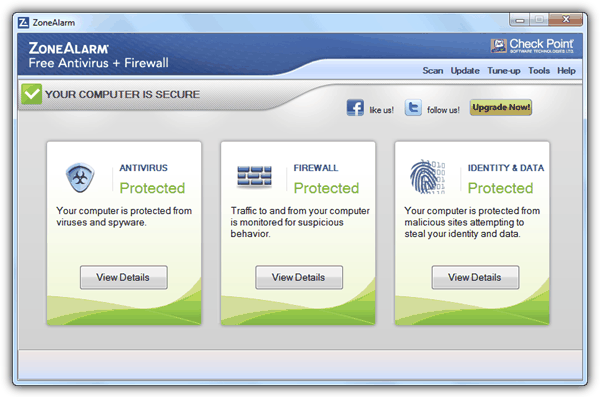 Panda is the first security company that started offering their cloud based antivirus for free. The free edition of Panda Cloud Antivirus comes with real time antivirus and antispyware, behavioral analysis to check if undetected files are safe, process monitoring and web filtering. The last time we tested Panda Cloud Antivirus, it was able to detect all virus sample while their competitors missed a few, making it a possible replacement for the traditional definition based antivirus. They even ranked number 1 for usability. However pay special attention during installation where it will be default select to install a toolbar and changing of your default homepage and search engine. Rising Antivirus is from China and it is claimed to have the largest user base from their country compared to their local competitors. The initial versions are in Chinese language and they’ve added English version for international release. They used to publish a comparison chart to show the differences between the free and paid versions but after an extensive research we found that they are actually the same except the InfoCenter tab that shows advertisements and news in the free version. Other than the antivirus module, you can find 6 other defense mechanism to further protect your system. 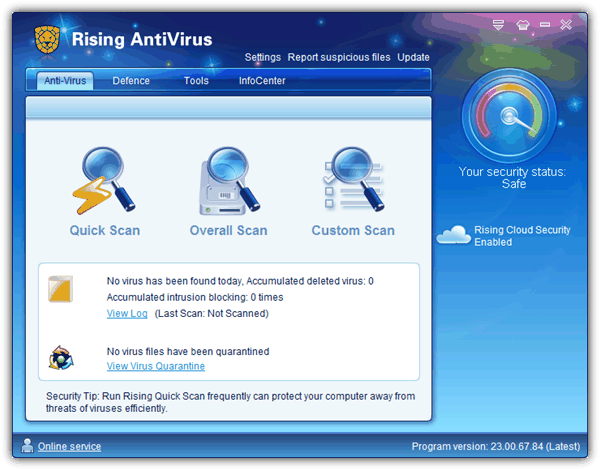 One of their unique feature is the ability to create your own custom Rising AntiVirus installer by running the Rising Installation Package Making from the Tools tab. Currently if you visit their international website at www.rising-global.com, you will see that they are still providing the 2011 version while their Chinese official site at www.rising.com.cn has already released V16 2012. Although their English site has not been updated for over a year, the virus definitions are still being updated daily. Kingsoft is another China company with its headquarters in Beijing, famous for their office application as an alternative to Microsoft Office. The company has been in the antivirus industry for over 10 years. 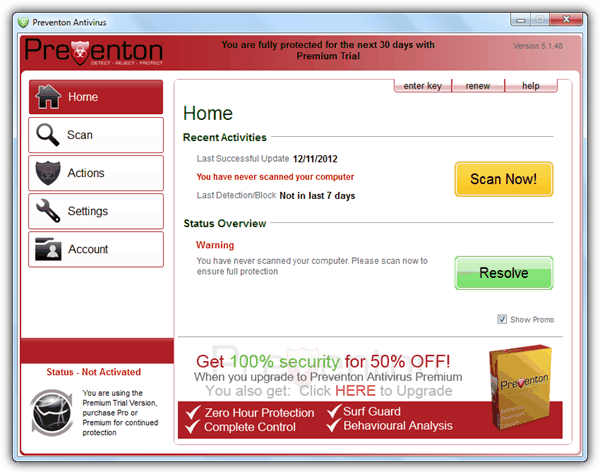 Kingsoft Antivirus is a fully featured antivirus program that is able to scan and clean viruses from your computer, provides defense to your web browser, instant messaging, watching videos, download files and even USB flash drives. It also comes with an anti-hacker module, not to be mistaken as a firewall. The anti-hacker provides an additional protection against common actions launched from remote access tool (RAT) trojan such as secretly turning on webcam and silently controlling the PC. You can find a vulnerability scanner, scheduler, process manager, silent mode and etc. We were a bit confused during our research on Kingsoft Antivirus because we can only find the Office product at their official Kingsoft website at kingsoftstore.com. Finally we found kingsoftsecurity.com that has only 1 webpage for Kingsoft Antivirus and a community support forum. 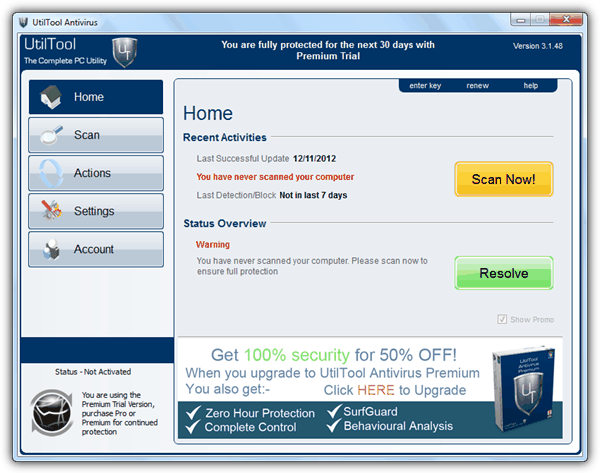 Nevertheless, their antivirus are up to date and is claimed to work along with other antivirus software. Something to watch out for is Kingsoft is available in 2 different distro’s, a cloud based and also a locally based definitions version. Although the forum information is slightly confusing, it is known that at least the local definitions version will include the excellent Avira antivirus engine in its upcoming 2013 edition. FortiClient is an endpoint security program developed by Fortinet, one of the leaders in providing network security appliances. FortiClient is free and can be either integrated/registered with FortiGate or simply ran as standalone without the centralized features that is mostly found only on enterprise networks. The unregistered free version of FortiClient comes with basic features such as VPN, two factor authentication, antivirus, web filtering, web optimization, application firewall, vulnerability scanning and client certificate support. 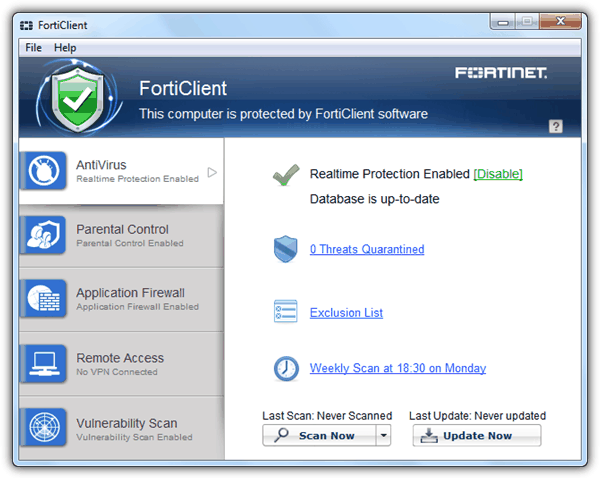 Overall FortiClient is a great free antivirus program that comes with additional features that’s easy to use and configure. In VB100 tests, they’ve passed 10 out of 11 with only 1 failed due to 1 false positive. 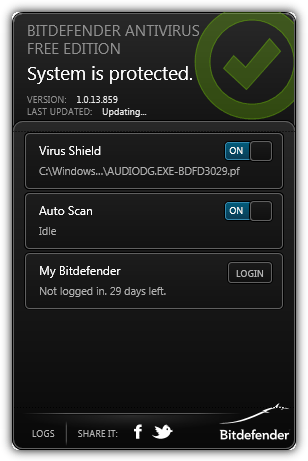 One bug that we experienced very often is the constant tray notification popup telling us that the antivirus is out of date and asking us to click to update even though the program and definitions are up to date. Do take note that FortiClient 5.0 runs up to 11 different processes by default. 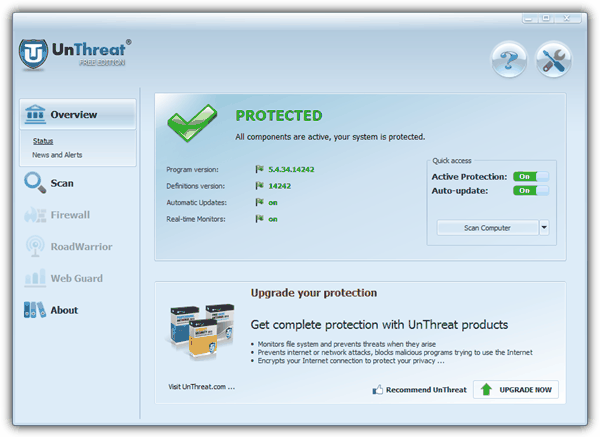 UnThreat is a new player on the antivirus industry that started in 2011. 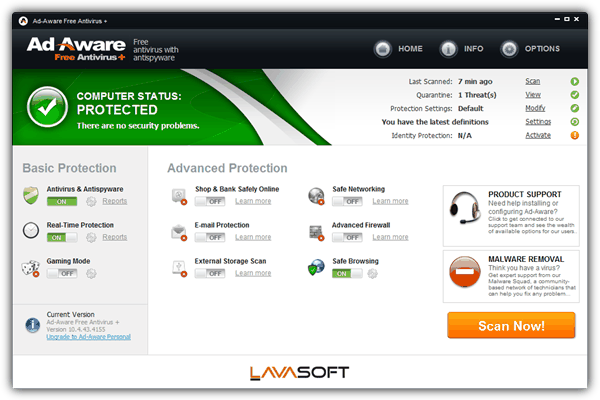 They offer a free edition, and two paid versions which is the PRO and Internet Security. 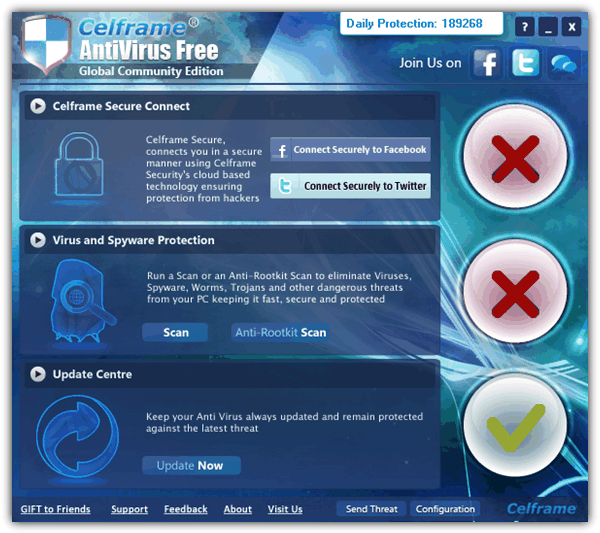 The free version of UnThreat has real time protection against computer viruses, automatic updates, email protection, scheduler, exclusions and suspicious behavior detection. 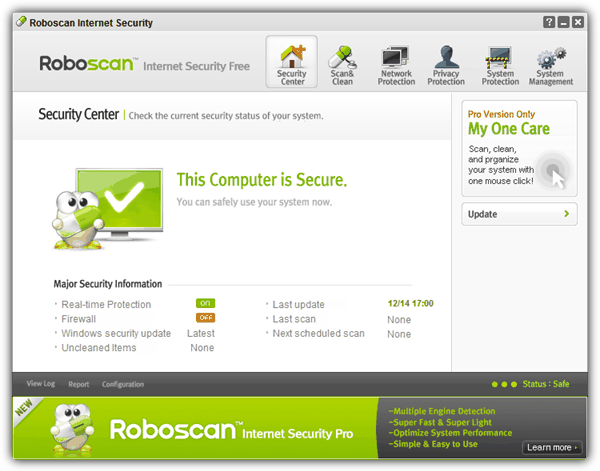 After installation, only the Scan tab is accessible while others such as Firewall, RoadWarrior and Web Guard are grayed out. Do not be fooled by the small 10MB installer because after installation the updater will download 3 definition files totaling 90MB in size. The first information that most people would look for is the engine being used whether it is an in-house or licensed from another antivirus company. From what we have discovered, there are quite a few DLL files in the program’s folder that is signed and belonged to GFI, the maker of VIPRE antivirus. The GUI is also very familiar because the button locations are very similar to Avast! and AVG. There is a popup being shown at the bottom right of the screen for a few seconds asking you to upgrade whenever the program checks for an update. 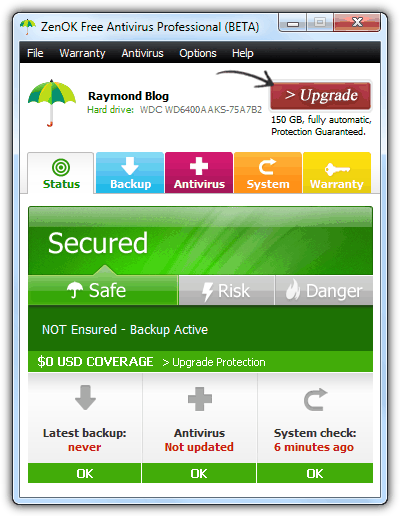 The free Comodo Antivirus is one of the very few that is allowed to be used at any place including commercial, educational and enterprise, unlike most of them are only allowed as personal use at home. It comes with 2 main modules which is the antivirus and Defense+. 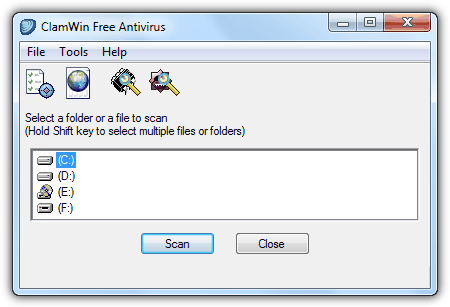 Basically the antivirus module allows you to run a scan, submit suspicious files to Comodo for manual analysis, real time protection, scheduled scanning and etc. As for the Defense+, it is an additional protection to further protect your computer against unknown threats by running programs in sandbox, heuristic and behavior analysis, cloud scanning and etc. You can also turn on the game mode from the tray icon and protect the settings with a password. Pay extra attention during installation because by default it makes a lot of changes to your system. The setup modifies your DNS server settings to COMODO SecureDNS, enable submission of unrecognized programs to Comodo, changing your IE, Firefox and Chrome’s homepage and search engine to Yahoo! At customize installation, you will see that it installs GeekBuddy for live support, and Dragon, a secure web browser by Comodo based on Chromium. Make sure you uncheck whatever that you don’t need. The installer itself is already nearly 100MB and the first time update will download a main definition file that’s nearly 100MB in size as well. NANO AntiVirus is made in Russia using its own engine with their own antivirus laboratory for analysis, testing and development. They have real time protection, file guard and web guard. Currently it is in beta and is available for free which we are unsure if it will remain free when the final stable version is release. NANO AntiVirus is very easy to use and understand because you can only find very little options and settings. Although the support team in their forum claims that the current beta version of NANO AntiVirus is stable, it is a general rule not to use testing (alpha/beta) versions of security software on production computers. Outpost Security Suite uses VirusBuster’s antivirus engine and VirusBuster has been acquired by Agnitum for exclusive rights. 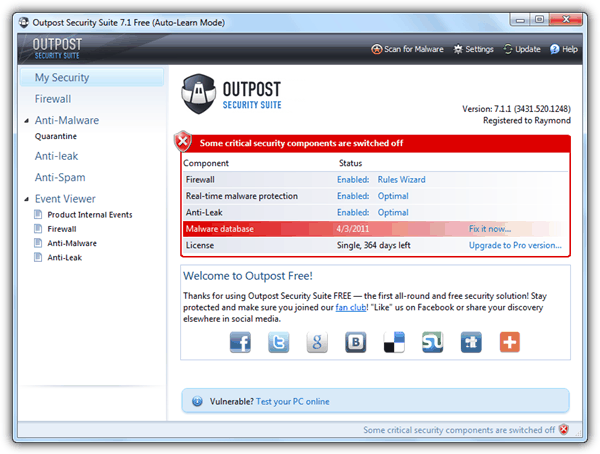 Although there are both free and paid versions of Outpost Security Suite, the free version still felt like a full featured security suite as it comes with a firewall, anti-malware, anti-spam and anti-leak but without technical support, priority updates and ID theft prevention. We were surprised to find out that there are 4 other free antivirus program (listed below between number 15-18) that uses Agnitum’s engine. In fact all of them have the same graphical user interface and features other than using a different color and icon/images. In fact we believe that UtilTool and digital-defender are from the same company because their website are hosted on the same subnet. If you would like to use Agnitum’s engine but don’t want their firewall, Preventon would be a better choice compared to ones below that are also using Agnitum’s engine. 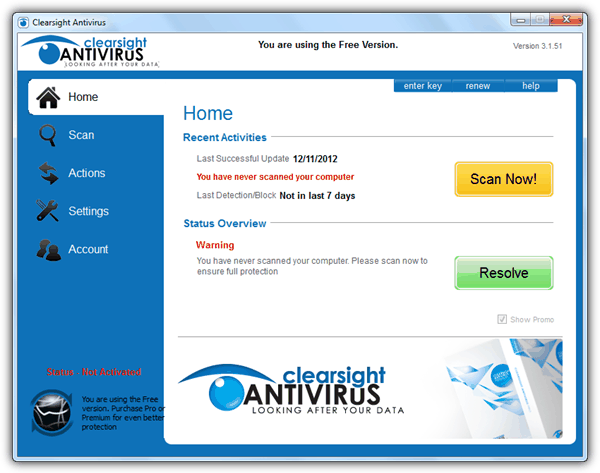 Clearsight Antivirus is currently for sale. The existence of this company in future is unknown. 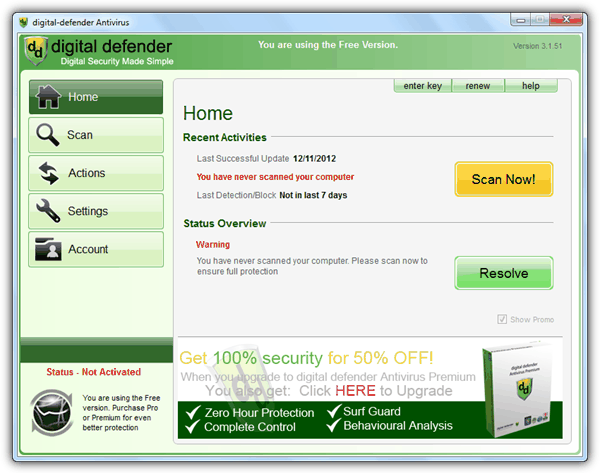 Although digital-defender and UtilTool uses legitimate antivirus engine, we would stay away from them mainly because of their business tactics. They seemed to be from the same owner/company and merely re-branded both the same software into different name. 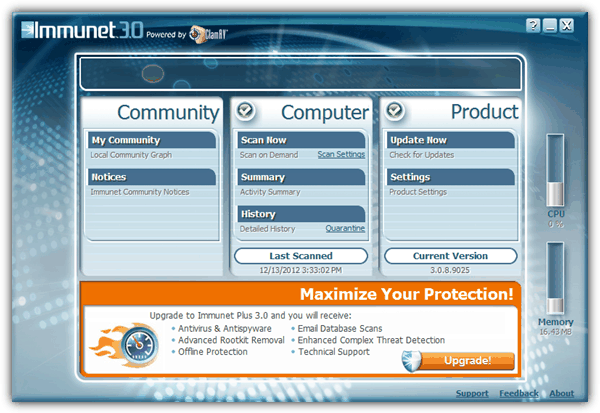 PC Tools is well known for their Spyware Doctor product and their company has been acquired by Symantec. The free antivirus version offers limited security with only 2 out of 9 “IntelliGuard” functions enabled to provide real time protection on file access and email attachments. A lot of other small enhancements such as game mode, cloud scanning, scan for hidden files, MBR threats detection, power save mode and etc are also disabled. 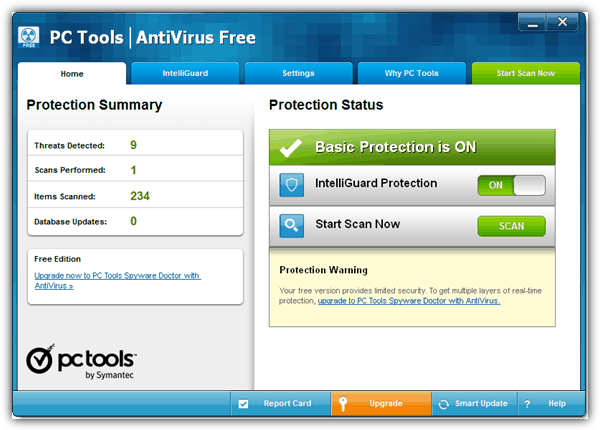 PC Tools AntiVirus has a unique feature where you can select the antivirus database size which is either Comprehensive or Compact. By default Compact is selected and it is a smaller definition that contains only signature for current malware threats, making the scanning process much faster. As for the Comprehensive database, it is the full definition that includes really old viruses that are no longer widespread. We can confirm that PC Tools AntiVirus uses virus definition files from Norton but the engine that powers the product seems to originate from VirusBuster as we found a few references from the DLL files located at the avengine folder. ClamWin is an on-demand front-end scanner of the free and open source ClamAV but without the real time protection. You can install another open source application called Clam Sentinel to enable real time monitoring of the disk drive for file access and then automatically scanning them with ClamWin. ClamWin has integration with explorer and Outlook. The preferences window allows you to add scheduled scanning, automated updates, filters, limitations and etc.